The chance to file taxes on a postcard is more complicated than it sounds. The U.S. Individual Income Tax Return 1040 Simplified Form is confusing accountants. The changes go beyond layout; some taxpayers accustomed to receiving returns for overpayments on tax withholding may expect to owe this year. The format of this year’s tax reform is anything but simple, says Scott Berger, principal of entrepreneurial services at Kaufman Rossin. The format differs from anything he and his colleagues have seen in the past couple of decades. “I guess our politicians can say they came through and kept one of their promises – the first page is almost the size of a postcard,” said Mr. Berger. The format differs from the old form in a few ways. Previous tax forms asked questions on 8½- by-11-inch paper. Basic information and income were detailed on the front page with the deduction, tax calculation and withholding overpayment on the second page. The new format comes on an 8½-by-11 paper but the information requested spans 6 inches deep across the width of the page with half of the page blank. 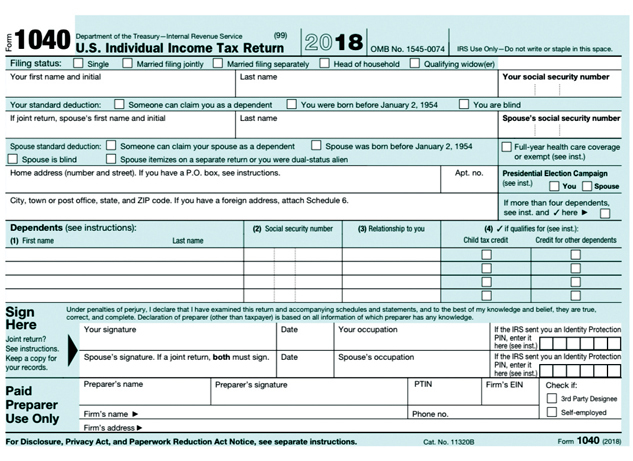 The first page asks for personal information such as address and social security number, whether the taxpayer is naming dependents, and a signature. The second page is the same postcard-like size with half of the sheet blank. Supplemental forms and supporting schedules follow beyond those two pages leading to the summary page. Mr. Berger often finds himself flipping back and forth between pages. The taxpayers receiving overpayment refunds and owing money to the government differ from last year. “There is a change in the withholding rates during the year for some people who were strictly W-2 employees. Even though their total tax liability decreased, they are hit with a significant balance due. The withholding tables taken into account and the reduction of rates, they were getting the benefit of it all through the year and now they are doing their returns and they owe money, which is going to surprise a number of people if they did not adjust the withholdings,” Mr. Berger said. It is too early to tell who is reaping any benefits from the changes, said Mr. Berger, but blue-collar workers seem to be lucking out. And by the lower end of the spectrum, Mr. Berger said, he means blue-collar workers. He urged the public to count on accountants this year, because filing solo or through an online platform can be difficult given the modifications to the 1040 form. Some can rely on online platforms, such as TurboTax, to file without worry such as the wage earner or retiree living on social security or bank interest. Others should count on a professional. The consequences of filing incorrectly solo or on an online platform are grim. “I’ve seen many a taxpayer being audited because their interpretation of what some of those questions mean,” Mr. Berger said. He said he hopes the Internal Revenue Service bids farewell to the postcard format come next filing season.